Dan writes, "Where did you get music track that is with the Flip video?" I'm assuming you're referring to the background music used in my sample footage from the Flip Video Camera review I wrote recently. 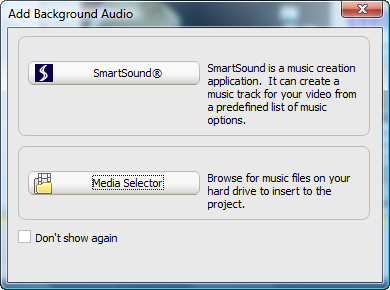 The music was created using the SmartSound plugin for Roxio Easy Media Creator. I reviewed the standalone SmartSound SonicFire Pro over a year ago and continue to be impressed with how much easier adding music to anything is using one of the various SmartSound tools. Many of the consumer editing apps now include the SmartSound plugin, including Pinnacle Studio, Avid Liquid, Ulead VideoStudio, Cyberlink PowerDirector, and the previously mentioned Roxio Easy Media Creator. 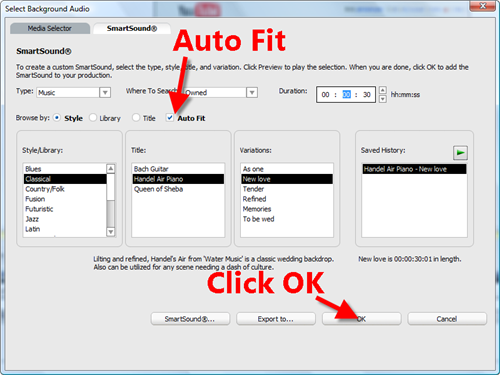 SonicFire Pro offers far more configuration than the bundled SmartSound tool, but in most cases you can make great music choices by simply using the plugin for your favorite editing tool. The coolest feature of the SmartSound plugin is that it automatically fits the music you select to the length of your video, so there's no messing around with trying to clip the audio to fit your video. Part of the automatic fit is having a start and end point to the song that sound like they fit, meaning no abrupt cutoff point in the middle of an arpeggio. The library of music included with the bundle is typically somewhat limited, but you can easily add more music from the extensive library available direct from SmartSound. If you're only creating movies for home and personal use, the rates for song libraries are reasonable. Prices are higher for professional use, but theoretically you're making money with your video productions in those instances. 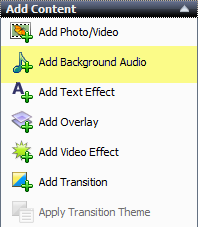 Select the section of video you want to add background music too in your video timeline. 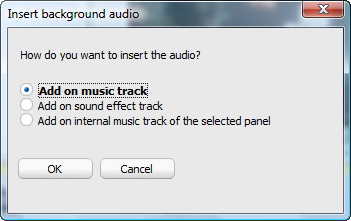 Choose Add Background Audio. Check the box to AutoFit and browse the library of music on your computer (you can also browse tracks available for purchase). Preview the selections until you find one that fits your needs. When you find what you need, click OK and the music will auto-generate. You will be given the option to add the SmartSound audio to the music track, sound effects track, or the internal music track of the selected panel, giving you flexibility to combine this with other audio in your movie.